My Leatherman Micra review sparked some pretty excellent responses in the comments section. 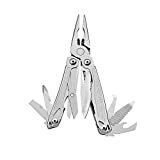 Great points were made about how much utility is packed into some of Leatherman’s smallest offerings, and how it’s sometimes more acceptable to whip out a multi-tool than a pocket knife. Knives will always be my first love (and main focal point of the website), but you can’t deny the practicality of a multi-tool. While the Micra is a great tool, it is based around scissors. I think most people associate multi-tools with pliers-centric designs. 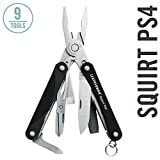 Enter the Leatherman Squirt PS4. It’s roughly the same footprint as the Micra, but based around a small set of spring loaded pliers rather than scissors. It seemed like a natural succession to my review of the Micra so I decided to pick one up along with a Gerber Dime to test out this segment of the multi-tool market. The Squirt has an overall length of 2.25″ (closed), weighs 2.1 ounces, and is made in the USA. This tool is similar in size to the Micra. The Squirt is a little thicker, but the Micra is a little longer. The PS4 is advertised as a “keychain multi-tool”, and while technically you could carry this on your keychain, I’m not sure if you would want to. This is a small tool and can be easily stowed in a pocket, or strategically tucked away in a tool kit, vehicle, or tackle box. That is primarily how I like to use these small multi-tools. They may not be a true “EDC” piece for me, but for around $25 most can afford to have this be a dedicated tool for their car, as part of a little tool kit, survival kit etc. Of course there is nothing wrong if you want to make this a daily carry object as well. And on the subject of price, I still can’t believe how nicely made these small Leatherman tools are for the money. The pieces all line up nicely. There are no unintentional sharp edges. The action of the springs are all high quality. The tools themselves are all nicely finished. There are no stray tooling marks and everything goes where it should. The handle scales are hard anodized aluminum. The pliers close neatly together. This is a quality tool that is satisfying to articulate. It’s not a disposable object, and it feels like you actually get something for your money. At the center of the Squirt is a small set of stainless steel pliers. The pliers come to a nice tip and are almost fine enough to be used as tweezers. They can certainly pluck hair, and could probably pull a splinter in a pinch, but they are strong enough to be used to pull staples and manipulate small bolts. The jaws open to over an inch wide but are better for smaller tasks. In fact, these pliers are great for getting into places that are too tight for my fat fingers. This is a nice list of commonly used tools. All but the wire cutter can be accessed from the outside without opening up the tool. That may seem like a small detail in theory, but in practice being able to access the tools without opening up the pliers is huge. I think that feature is right up there with spring loaded pliers. The scissors are very small. They cut, and can work for delicate tasks, but I wouldn’t want to use them for a lot of cutting. That said they are sharp, spring loaded, and certainly cut. They can be great for when you need to trim something small or make a delicate cut, like trimming away heat shrink from a wire. The knife blade is small but serviceable. It is flat ground with a chisel edge, and comes sharp out of the box. It’s made from 420HC steel. It won’t win and edge retention competitions but in a pinch it will open a piece of mail or shave down a piece of wood. It’s a slip joint, but if you are smart with it you will be fine. The file is possibly my favorite tool on the Squirt. It’s over an inch long and is double sided. One side is a single cut file, the other is double cut. Both sides are abrasive and work great for small jobs. The screw drivers are adequate. The “Phillips” driver is not a true 3-D driver, but it can work in a pinch. The flat head driver is about a quarter of an inch wide and works well. The bottle opener is small and shallow. It will get a bottle opened, but takes some work and is a far cry from the bottle opener on the Alox Cadet. As I mentioned in the intro, I bought this along with the Gerber Dime. I think the build quality of this Leatherman blows the Dime out of the water. The Dime isn’t a bad tool, and it’s anywhere from $5-15 cheaper than the PS4, but I prefer the PS4. I mostly prefer the PS4 for it’s slightly better build quality, and the bottle opener jutting out of the back of the dime turns me off, even if it’s a more successful bottle opener than the one on the Squirt. That said, others have had great luck with the Dime, so if you are torn you can buy them both for under $50 like I did. If I could only keep one I like the PS4 more. They say the best tool is the one you have on you. The Squirt isn’t going to replace a tool box, or even a full size multi-tool, but it’s handy in a pinch for small jobs. Given the size constraints I think it’s a great little multi-tool, and you get a lot for your money. That said, I prefer a full size multi-tool for working on bigger projects. The problem with a full size multi-tool is that they are tough to carry unless you can get away with a belt sheath. I continue to be impressed with the fit, and finish of these inexpensive Leatherman tools. The stellar build quality combined with how they are legitimately useful, make this one a win for me. The fact that the Squirt is made in the USA is icing on the cake. This is a great back up or EDC item. Even if it doesn’t get tons of use, at around $25 you can’t go wrong with it. 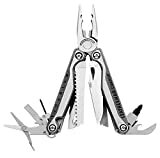 I recommend purchasing the Leatherman PS4 Squirt at Amazon. Please consider that purchasing anything through any of the links on this website helps support BladeReviews.com, and keeps the site going. As always, any and all support is greatly appreciated. Thank you very much. I have never been able to consistently Every Day Carry (EDC) a full size multi-tool. I have a couple, and they have come in handy, but I don’t regularly EDC them. 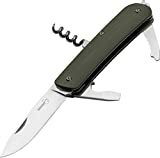 They are great to have in a car tool kit, a tackle box, for camping, or possibly if you work a physical job. But as a desk jockey I get way more mileage out of a Victorinox Pioneer than with your standard multi-tool. And then there is the Leatherman Micra. I have owned one for a few years now. My father has one, and I picked one up on a whim after checking out his. There is something extremely satisfying about this little tool. The spring loaded scissors are unlike anything else in my gear collection. I thought it might be fun to switch things up and offer a review of my Micra. The Micra has a closed length of 2.5 inches, a 1.6″ blade, weighs 1.8 ounces, and is made in the USA. Closed it’s about the size of my thumb. An easy enough option to EDC. Some people carry this on a keychain, and there is a lanyard loop that you can fold away if you don’t want to use it. I already have enough on my keychain, plus as a lawyer it would quickly get confiscated if I forgot to remove it before going through court security. It is slightly thicker than an Alox Cadet and much shorter. It truly is a micro piece of EDC gear. The main attraction to this tool is the spring loaded scissors, and man are they sweet. First of all, the spring loaded aspect of this tool is extremely satisfying. The fidget factor is off the charts, and I regularly find myself absentmindedly opening and closing the tool. The spring loaded aspect alone is worth the price of admission. But what puts things over the top is how sharp and useful the scissors are: they are indeed sharp and useful. And strong. They are so strong that I think calling them “scissors” is not giving them enough credit. They are almost shear like in their capabilities. I regularly use them to trim my fingernails. 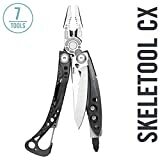 Hopefully that wasn’t too much information, but it goes to show that these aren’t the little scissors that come on the Swiss Army Knives or full size multi-tools. These are several steps above. If you aren’t into using the scissors on the Micra as an impromptu grooming tool, then they can easily cut zip ties and plastic packaging. I could see them cutting through a shoe in a pinch (in a first aid situation), but ideally you would want something bigger. They don’t replace full size scissors if you have to cut a lot of cloth or paper, but they are stout, tough, and sharp. Obviously, the scissors aren’t the only tool on the Micra. You also get a penknife, a large flathead driver, a small flathead driver with a cap lifter built in, a “Phillips” driver, tweezers, and a combination nail file and nail cleaner. The knife blade is a small clip point that is flat ground with a chisel edge. It’s sharp and serviceable, even if it’s about 1-5/8″ long. This isn’t going to perform like a full size knife, but you can cut stuff with it in a pinch. The blade doesn’t lock open, but there is a backspring and it snaps in place. The spring is weaker than a Swiss Army Knife, but this is not a knife you are going to want to use heavily any ways. It can open a box in a pinch, but probably the biggest draw to the knife is its needle fine tip. Leatherman actually includes 420HC blade steel on the Micra. On a regular pocket knife 420HC is pretty ho-hum, but for a ~$20 multi-tool I think this is an outstanding choice. 420HC lacks the edge retention of higher end steels, but I think it’s a fine choice for the small blade on the Micra. On the subject of steel, the steel that Leatherman has used here is pretty good. Mine occasionally spots with rust, but it cleans off easily and has never been a serious problem. Leatherman has been at this for over 30 years, so I imagine they have given the steel they use a healthy amount of consideration. The 2 flat head drivers are nice enough. I can’t say either has gotten a ton of use, but the fine one is also integrated into a bottle opener. You can never have too many bottle openers, and the screwdrivers can be used in a pinch. The Phillips driver is more of 2 dimensional driver, rather than a true “3-D” Phillips driver. It’s not perfect, but better than nothing. On a tool of this size and at this price point there will be compromises, and the lack of a true Phillips driver is one of them. There is no way you are going to replace a full tool kit with a Micra. The file is really just a nail file. You won’t be able to use it for much more than that. With that said, I think including a nail file is nice, and it compliments the scissors. It has good abrasiveness and has held up well after several years of occasional use. No complaints here. The tweezers are probably the tool I have used the least. I prefer the tweezers on my Swiss Army Knives. The tweezers on the Micra are kind of blunt, and I have never used them on a splinter, but they are fine enough to pluck hair. Rounding things out is a ruler. It has been integrated into the back of the handle like most multi-tools. It’s awkward to use, but it doesn’t take up any additional space. All told, I think the feature set on the Micra is robust given the size and price restraints. This is a nice assortment of common tools. You need to open the scissors to access the tools, but a small multi-tool like this is going to require some fidgeting. What impresses me most about the Micra is how nicely it is made. It’s a sturdy tool, but it is also nicely finished. There are no sharp edges (besides the blades of course), no tooling marks, the grinds are nice on the scissors and knife, and everything fits together as it should. The pivot is riveted, and my Micra has a small amount of play in it, but beyond that everything reeks of quality. It’s hard to believe that they make these in America and offer them at the price that they do. For under $25, this is a multi-tool that I think pretty much anyone would enjoy. Sometimes mine ends up in the medicine cabinet, but it’s good for a tackle box, first aid kit, the car, or small tool kit. They manage to cram a lot of utility into a small package. This is the kind of tool where you can buy a couple and keep them stashed strategically, or have one that is part of your EDC. They also make great gifts. As a knife guy this Micra won’t replace my Swiss Army Knives, but the spring loaded scissors are great, and the Micra is one of the more endearing pieces of EDC gear that I own. If you have never been able to justify a full size multi-tool then you may enjoy a Micra. If you already are a multi-tool guy then odds are you already own one. Either way I highly recommend it. 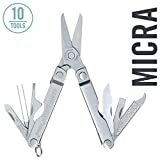 I recommend purchasing the Leatherman Micra at Amazon. Please consider that purchasing anything through any of the links on this website helps support BladeReviews.com, and keeps the site going. As always, any and all support is greatly appreciated. Thank you very much.